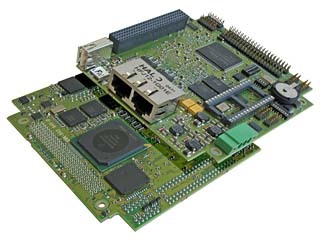 The MIP470 is a rugged embedded industrial SBC in PC/104 form factor. As processor, the Freescale MPC8347E PowerPC with integrated FPU and encryption engine is used. The solution is ideal for applications requiring small size, high performance and low power. For easy cooling the CPU is placed on the bottom of the board. All components required to build an industrial PC system are already on-board. The available PCI-104 interface offers easy and flexible expansion capabilities. Integration of the MIP470 into a system is facilitated by the fact of offering standard connectors for E-IDE, USB2.0 and Gigabit Ethernet. The four serial interfaces can be accessed through 2 mm headers. The MPI470 design fulfills the CE, FCC and MIL810F requirements. The DDR SDRAMs are soldered on board and are ECC protected. These features make the MIP470 ideal for any embedded control application requiring small size, high performance and low power. The products are being used in aviation and transportation systems, industrial or any other rugged/ secure application like medicine. Low power Freescale PowerPC MPC8347 CPU with FPU (up to 400MHz), equipped with 2x USB2.0, 4x RS232 on header, 10/100/1000 Ethernet (RJ45), 2x IDE ports, 256MB ECC DDR SDRAM & 16MB Flash soldered on board.